I use Windows. My favorite text editor is Microsoft Word. If I have any text to edit in other programs, I highlight it, copy it, then paste it in Word. While an easier method for this is yet to made for Windows users, Mac users have got great tool to assist them in this task. I am referring to QuickCursor. QuickCursor is a free tool for Mac users that provides them with a great way to edit any selected text with their favorite installed text editor. 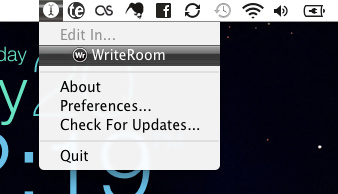 The application places an icon on the Menu bar. After highlighting a particular piece of text in any program, we click on QuickCursor’s icon to display a submenu. From this submenu we select an installed text editor in which our highlighted text will open. This simple process can also be used to select a simple text editor so that our highlighted text is copied without its formatting. Mac users will find that QuickCursor works swimmingly for majority of their applications. For applications that QuickCursor does not work with, often editing is not required or an alternative method can be used. For instance the tool is known not to currently work with Chrome or Firefox, but it does work with Safari; therefore users could start using Safari from now on in order to use QuickCursor. QuickCursor is a great freeware utility to have which is soon expanding support for applications.